Dimensions: 66cm x 47cm x 22cm, (26" x 19" x 9"). Folded dimensions 66cm x 47cm x 3cm, (26" x 19" x 1-¼"). Mesh size: 10mm, (3/8") square mesh. Dimensions: 69cm x 50cm x 32cm, (28" x 20" x 13"). Folded dimensions 69cm x 50cm x 3cm, (28" x 20" x 1-¼"). Mesh size: 12mm, (1/2") square mesh. Dimensions: 95cm x 63cm x 50cm, (38" x 25" x 20"). Folded dimensions 95cm x 4.7cm x 4cm, (38" x 25" x 1-5/8"). Mesh size: 16mm, (5/8") square mesh. Has vinyl covered high tensile steel hoops, two funnel-type collapsing mesh doors, brass closure snap, and anchor points for weights. 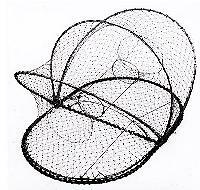 Used for trapping fish, lobsters, shrimp, crabs, octopus, and eels. 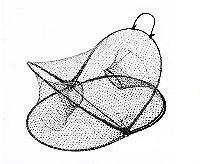 The collapsible nature of these traps is a very popular feature because it allows fishermen to carry many more traps per outing. Holding to higher catch ability and the safety factor due to less bulk on deck. Can be used by both hobby and commercial fishermen as well as by the scientific and government sectors. 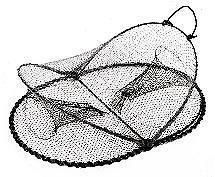 With careful handling and placement, a long life and great fishing ability can be expected from these traps. The traps are also cost and labour efficient. Escape hatch doors can be added easily based on regional regulations.